Charleston County residential recycling program is single stream instead of separating recyclables by type, residents can combine all paper, cardboard, glass, aluminum and plastic containers into one wheeled roll cart. This cart-based method of recycling is an easier way for residents to recycle. Instead of carrying multiple bins to the curb, residents are able to simply roll a cart to the curb. This state-of-the-art program utilizes automated trucks to collect recyclables that can be placed together in a single roll cart, as opposed to having to separate recyclables into two containers for collection via the old dual stream program. Rather than using two or more 22-gallon curbside bins, the single stream residential recycling program allows residents to use one 95-gallon roll cart collected once every two weeks. In January 2011, Charleston County's Environmental Management Department launched a pilot program involving 4,600 homes across the county. The County observed a considerable increase in the amount of recyclable material collected from each residence participating in the All-In-One pilot program. The All-In-One program averaged 21 pounds of recyclable material per home per pickup, a significant increase from the 10 pounds per home per pickup with the standard dual stream curbside bin program. Additionally, following a 6,000 home expansion in October 2011, the County observed participation rates as high as 70% in All-In-One areas, compared with rates averaging 35%-40% for the rest of the County. 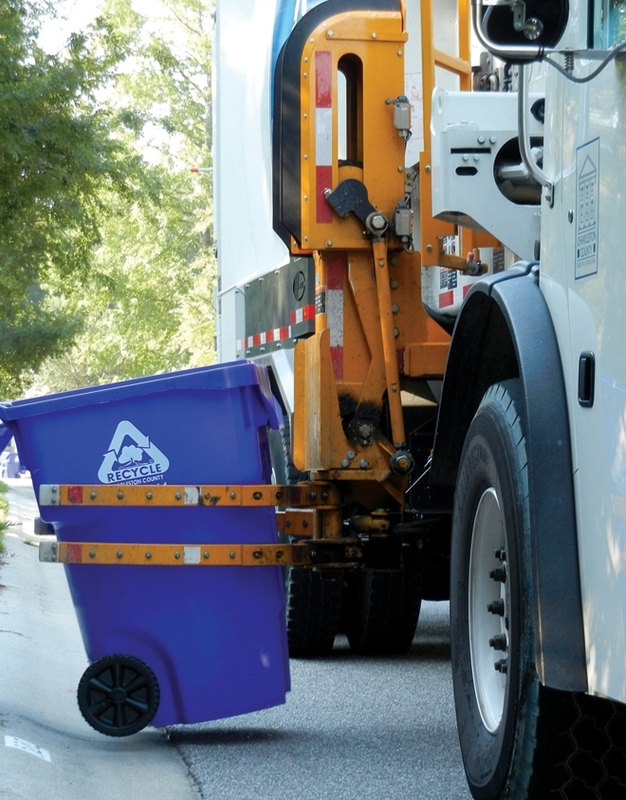 Based on the success of the pilot, Charleston County continued to incrementally expand the program to include all areas currently serviced on curbside recycling routes, implementing a County-wide program in June 2014. Proper cart placement makes Charleston County's automated collection safer, cleaner, and more efficient. Set your cart at least 3 feet away from cars, mailboxes, and trees or shrubbery. Make sure the handles of the cart are facing your house. Only recycling roll carts issued by Charleston County can be used for this program. Old 22-gallon recycling bins or small recycling bins purchased on your own cannot be collected by our trucks at the curb. Feel free to use these bins for recycling stations around your home, but please do not place them at the curb;Charleston County reserves the right to remove small bins that are placed at the curb due driver safety issues. Please flatten cardboard boxes and place them in the cart. If you have additional cardboard that will not fit into the cart, break down the boxes and place them beside the cart. Please cut large boxes, like appliance boxes, down to 3 x 3 feet so that they will fit into the truck. 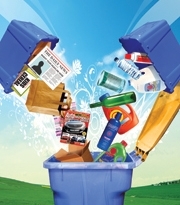 If your household is consistently overfilling your provided cart, please contact the Recycling Center at (843)720-7111. Empty and rinse all containers to remove food residue. Flatten boxboard and corrugated cardboard. If you have any questions or concerns, call the Charleston County Recycling Center at (843)720-7111. Q: What is single-stream recycling? A: Instead of separating your recyclables, you can mix them together in your single stream roll cart for automated collection instead of separating out into two separate streams into two containers (dual stream). The sorting is done for you at the recycling center. We make it easier so you'll recycle more! Q: What is automated collection? A: It is a way of collecting recycling using a special truck with a robotic arm that does the lifting and emptying for the driver. It is faster, safer, and more cost efficient. Q: When can I expect to recieve a roll cart? A: Upon requesting a recycling roll cart, staff will deliver a cart to your residence. Please allow 7 to 10 business days for delivery. Q: Can I use my existing blue recycling bin? A: If you have an old, 22 gallon curbside recycling bin, please note that we no longer service these bins. Only roll carts are serviced due to the type of automated truck being used to empty the carts. We recommend using your old bins for recycling stations around your home and then transferring the contents into your cart for curbside service. Q: Where should I place the cart? A: It is very important that you place your roll cart properly at the curb so the robotic arm can lift it. 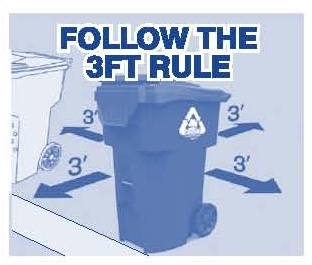 Keep a clearance zone of 3 feet around the cart, away from mailboxes, parked cars, trash cans or trees. Arrows point toward the street and the handle points toward your home. Lid is closed. Q: When should I put the cart out? A: Your cart should be at the curb before 7:00am on your scheduled pickup day. After it is emptied, return it to your garage or backyard storage area to keep it safe and clean. Q: What about large corrugated cardboard boxes? A: Corrugated cardboard is valuable for recycling. Please flatten your boxes and put them in the cart. If your boxes do not fit in the cart, break them down and place beside the cart. Please cut large appliance boxes down to sizes closer to 3 x 3 feet so they fit in the truck.